it was a quaint place with it's own art price and local groups had their meeting there. it even had it's own chocolate maker as well as small gifts and cards. now it is just another beer joint, so sad. Their beer is very smooth and flavorful. Our favorites are the Blacktop, Pennywise, and Citradisiac. I even liked the Road Rage and I'm not an IPA drinker. They offer ciders and wine uncorking for a small fee for the non-beer drinkers. Good snack menu and family friendly atmosphere. This restaurant is in transition and is more of a brewery now, but don't let that keep you from stopping by for a great cuppa. We were greeted by the sweetest barista, Erin, who took our order and made us custom coffees. Double espressos with a bit of steamed milk. Great coffee and great staff. I have only been there for breakfast a few times. The breakfast sandwiches are great, they have wi fi so you can look at the computer with breakfast. All around good place to stop for coffee. Recently the place has undergone a fairly radical change. The counter has encompassed a much bigger area of space, which leaves less table seating and darker woodwork was added. It no longer feels like a coffee shop. This was part of a change in business plan to start serving beer, which I hope is a success for the owner. He seems to be a very nice guy. The coffee shop food has never been that great, just average breakfast sandwiches and lunch paninis and instant oatmeal cups and such. The chocolates sold in the coffee shop are pretty good. The hot tea situation is kind of a joke, there's a basket of Numi brand tea bags but you can't count on getting the flavor you want, and just plain black tea is not offered. The coffee is pretty good. I like flavored mocha's and have to have it sugar free, and their's is pretty good. Daily Brews used to be the best cup of coffee you could get in Wayland. There are challenges to that now, which may be where the new beer business plan is coming from. 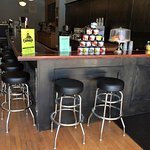 Been to Daily Brews Gourmet Coffee CF? Share your experiences!